We’ve all heard the phrase “Sip all day, get decay”. This is no myth! Sipping soda rather than drinking it quickly can make a big difference in the way it affects the health of your teeth. Did you know that the acid level in your mouth is naturally neutral? When we eat or drink anything, it is normal for the acidity level in our mouths to drop in to an unhealthy level. Cavity causing bacteria thrive in this environment. Once you are done eating or drinking, it still takes an additional 40 minutes for your mouth to return to a neutral level. Think about it: If you drink a soda in a 10 minute time frame, your mouth will be acidic for 10 minutes + the 40 minutes it takes to return to normal. A total of 50 minutes. If you sip a soda for an hour, your mouth with be acidic for 60 minutes + 40 minutes. A total of 1.6 hours. This is a long period of time for bacteria to grow and attack the enamel on your teeth. 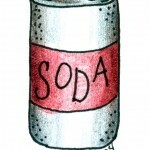 No wonder soda sippers have a higher rate of tooth decay! Some helpful hints for those of you who still like to enjoy a sweet treat: swish your mouth with water after enjoying a soft drink. This will help reduce the amount of time your mouth stays acidic. You can also brush your teeth or chew a piece of sugar free gum. It is important to know that not all sodas are created equal! While Pepsi and Coke are most acidic next to battery acid, Root Beer is less acidic. Talk with your hygienist about alternative drinks you can enjoy that have a lower risk of causing cavities. A cavity free exam = a happy dental staff!